Hello beautiful girls, I hope you are having a lovely day. 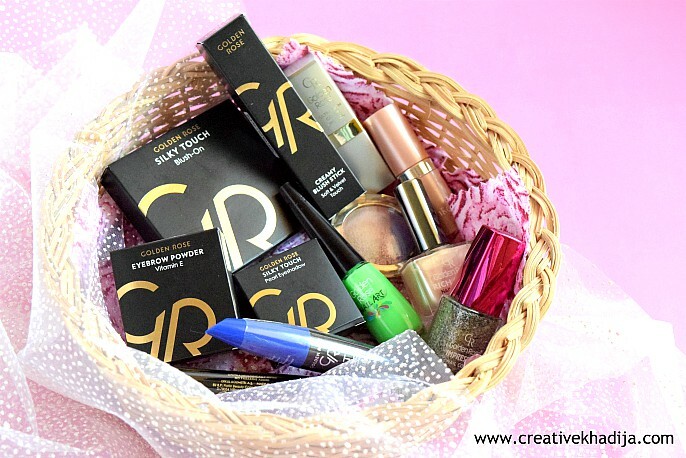 I am glad to know your feedback about my previous cosmetics hauls & reviews. Thank you for enjoying my beauty products reviews. 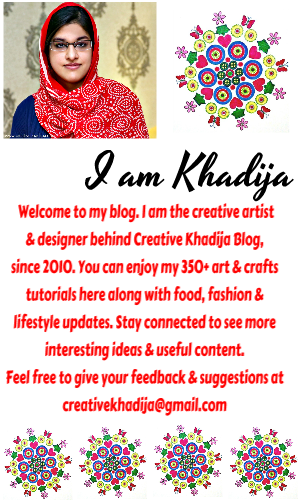 Today again, I am going to share some useful products review with you. 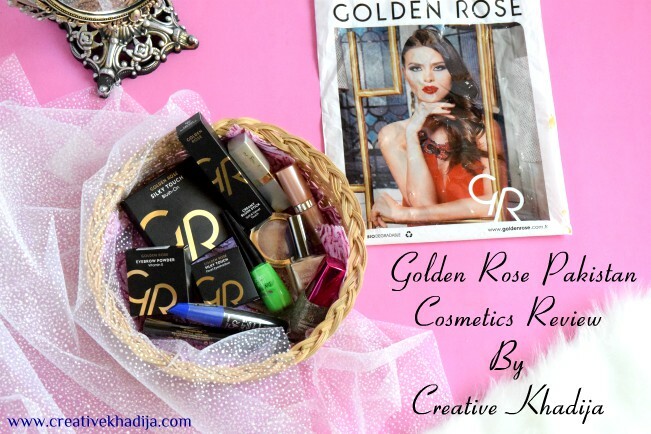 I’ve received a beautiful package of cosmetics from Golden Rose Pakistan. 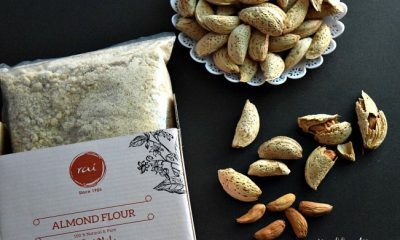 They recently started selling in Pakistan. You will see some of their products swatches & review today. 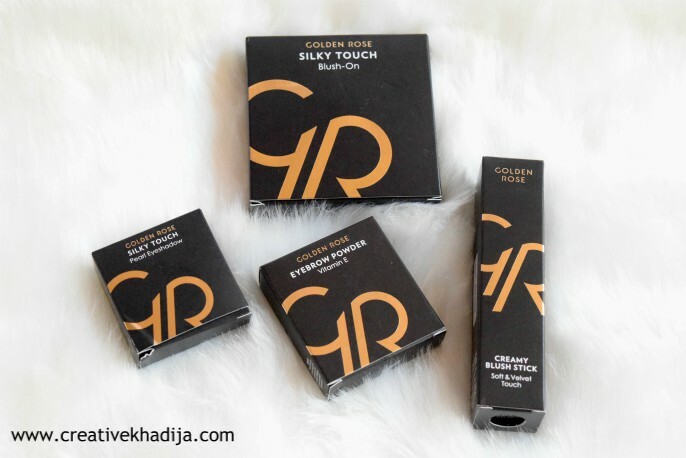 I got 12 beauty products from Golden Rose Cosmetics. Let’s have a look at them one by one! 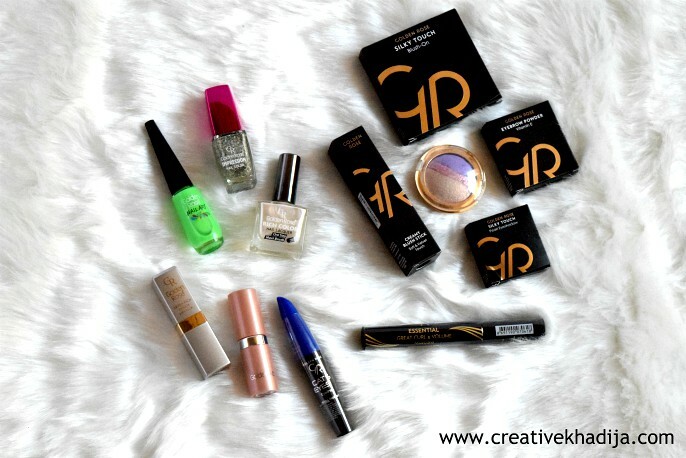 Here I’ve got Three nail colours, two lipsticks, Five eye makeup products & two for the face. The package was nicely packed in a box & nothing damaged or in poor condition. I received all products in good condition. Four products were in packing by the brand while others were without any packing. Though mascara and eyeliner were sealed. 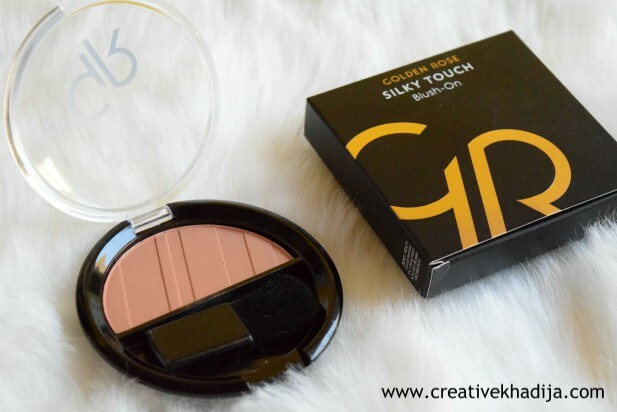 This silky touch blush-on by Golden Rose is soft pigmented. In the packing, there is a brush too for application but I think it’s really small for the blush-on purpose. Overall the product is handy & good pocket size blush on for your handbag. the shade of this blush on is 205. I will rate this blush on 4/5. This Eyebrow powder is dermatologically tested & no parabens added in it. 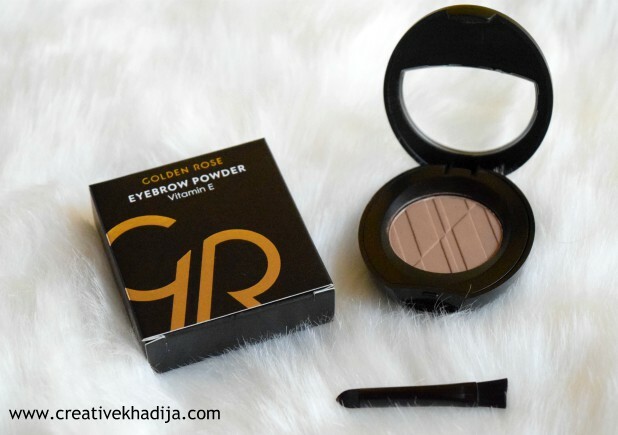 I always prefer using black eyebrow powder but after using this one, I am really satisfied. I like it’s little brush with a hard tip which keeps the eyebrow proper and applies the powder nicely. It’s with vitamin E specifications. Product shade number is 102. I will rate this eyebrow powder 5/5. 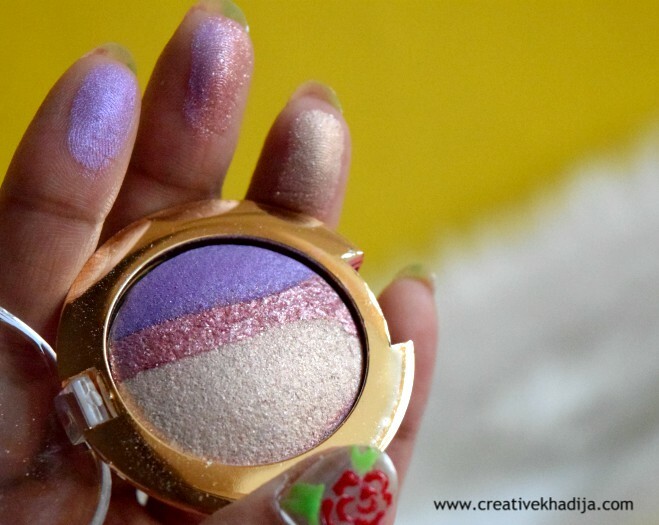 Golden Rose pearl eyeshadows is another pretty product with a perfect pigment of shimmer & shade combination. You can see it’s swatch in the picture below. You can get this shade 109 from GR. Check this pigmentation of shade on my finger. I find this shade really well. Nice shimmer & shine combination. I will rate this pearl eyeshadow 3/5. Do you like using blush sticks? I think this is one really quick way to outline & even contour your face with a stick blush. 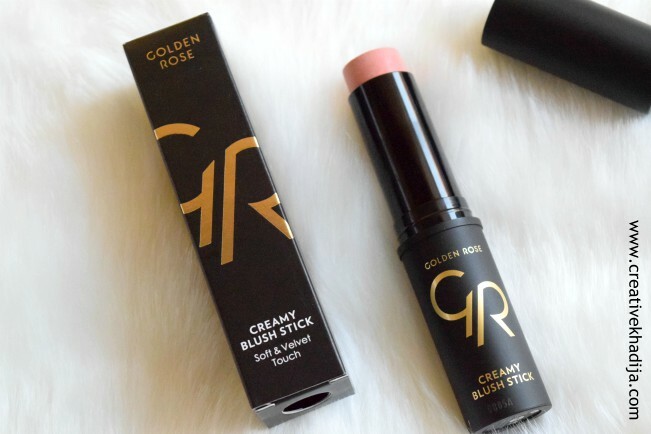 I got this Creamy Blush Stick which is soft & velvet touch. Very fine in application & blends easily with the brush. This shade number is 104. I will rate this soft & velvet touch blush stick 3/5. Have a look at these beautiful products shades Simply yummy. Can’t wait to use them more often. I love trying different nail art & colours. 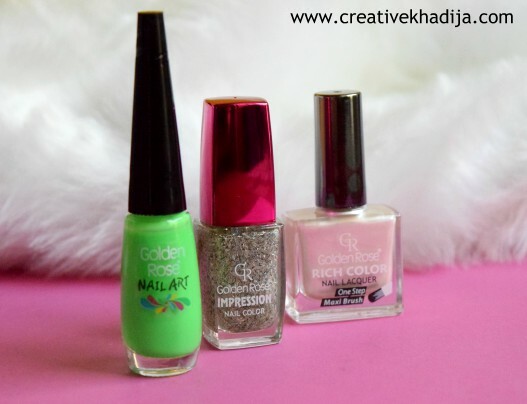 I received three nail polishes, One for the nail art in fluorescent colour, The other with glitter chunks is transparent & third one is nail lacquer. I applied this nail art to show you the products well. This nail art colour is with very thin brush tip, which gives perfect strokes for applying any kind of nail art. You can see the green leaf design on my nails. 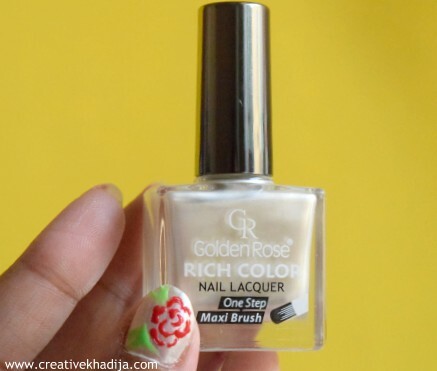 Golden Rose rich colour nail lacquer is with a maxi brush which helps to apply nail colour on the nail very easily & perfectly. 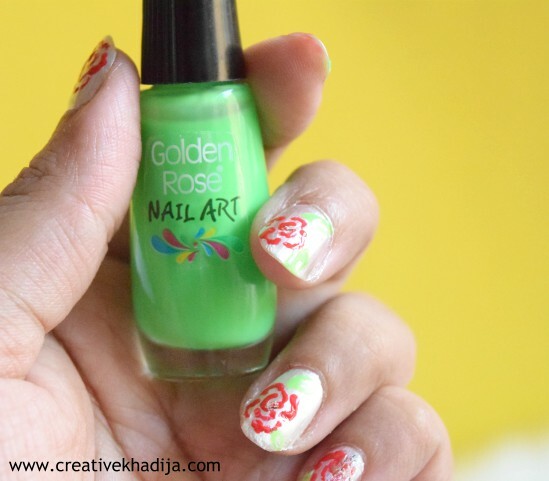 For this red flower nail art, I’ve used Stageline cosmetics nail colour. I will rate these two nail colours 5/5 while the nail lacquer with glitter chunks 3/5. 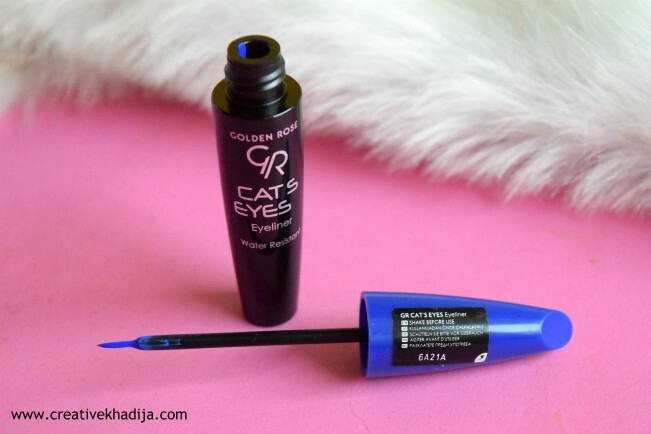 Have a look at this beautiful eyeliner by Golden Rose. I like the colour blue as it’s in fashion these days. This cats eyes eyeliner is very fine in application. Its colour is matte blue & it dries quick. One thing I usually see in eyeliners & mascaras if it’s water-resistant or waterproof, This one is water resistant. You need to shake well before use for the perfect result. Neon eyeliners are already trending these days. 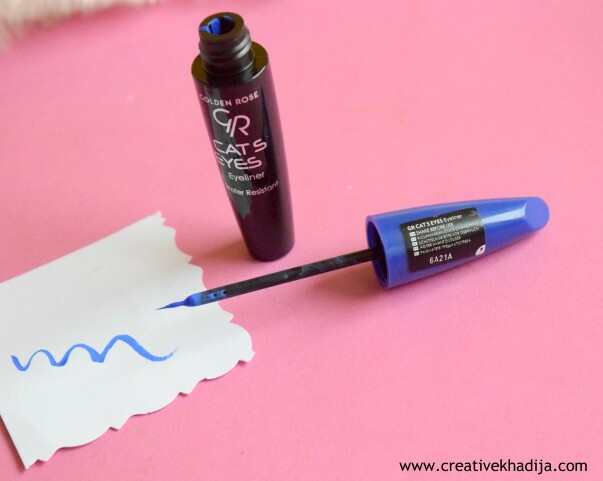 I hope you will like this GR Cats Eyes Eyeliner. I will rate this cats eyes eyeliner 4/5. Though I am not comfortable with water-resistant eyeliners. My first impression with this mascara was confusing. As I open the seal & tried to use, it looks like its dry. But it was NOT. 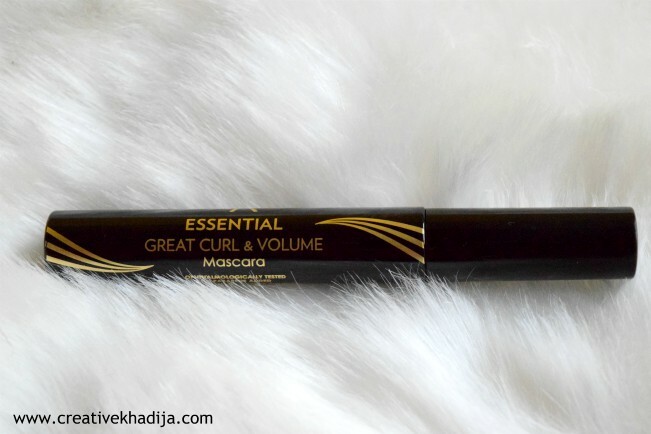 After applying this mascara, I was surprised to see it’s quality & thickness. Very good in volume & thick consistency as well. It’s 9ml in this tube & sealed pack. 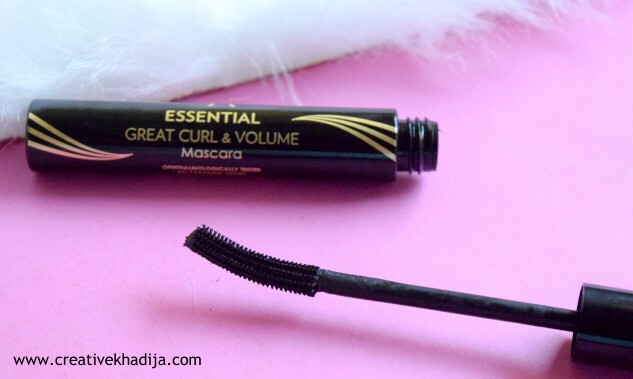 Essential Great Curl & Volume Mascara is waterproof & its wand brush shape is also according to the lashes. Easy to apply & it gives good volume to your eyelashes. I will rate this great curl mascara 4/5. These both lipsticks are very nice shades. The one in square shape packing is 05 shade with ultra rich colour. I like the shimmer with pink shade. 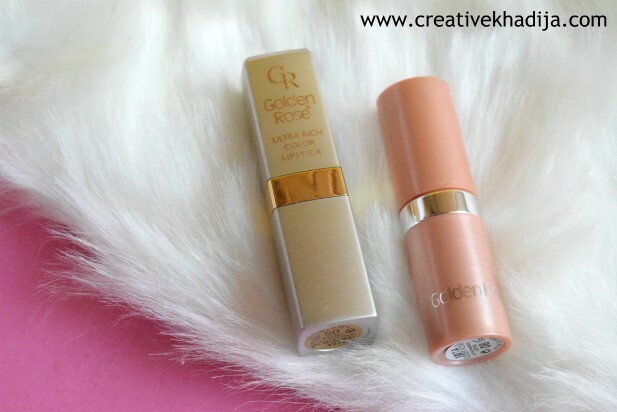 This peach packing one lipstick is Golden Rose Ultra Diamond Lipstick. its shade is 08 which contains glitter & ultra shimmer which looks attractive. With vitamin E extracts, it gives moisturizer to the lips. Though I am not a big fan of shimmery lipsticks but still it’s going to be a part of my pouch for using more often. Isn’t it pretty? I like the colours and shimmer but the ultra-rich colour 05 glitter irritates my lips. I will rate that one lipstick 3/5 & other 4/5. This is sparkle trio eyeshadow terracotta is in 404 shade. 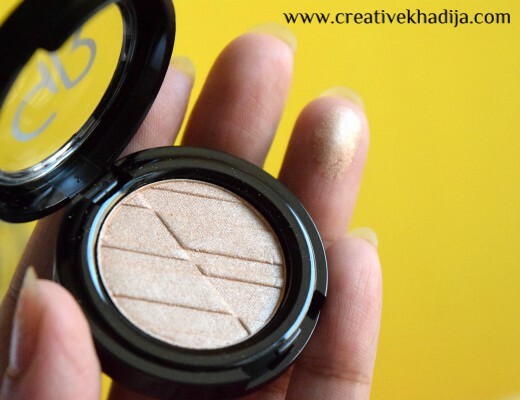 The shimmer & shine is perfect for highlighting eyes with a little makeup. 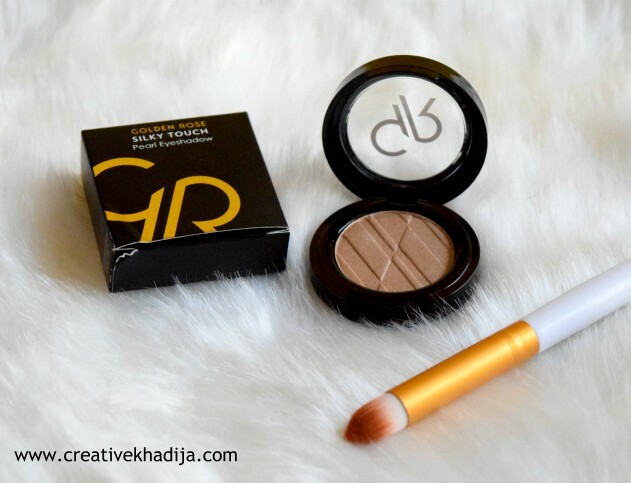 This eyeshadow trio soft shade can also be used as a highlighter because it gives amazing pigmentation. You can be creative with any products & it’s not necessary to only use it for eyes. you can always experiment. I will rate this trio eyeshadow 4/5. 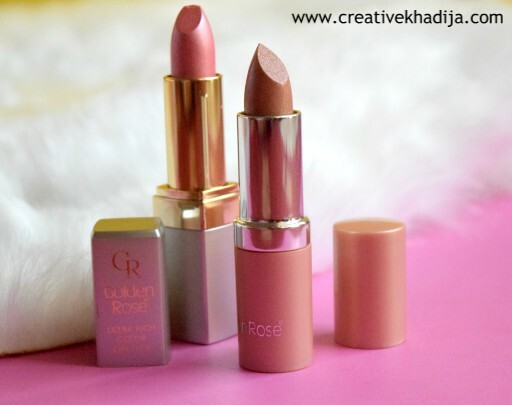 All of Golden Rose makeup products are made in Turkey. There is a wide range of products as well as shades. Prices are also reasonable & I am sure you will like the quality too. I hope you will find my today’s review useful. 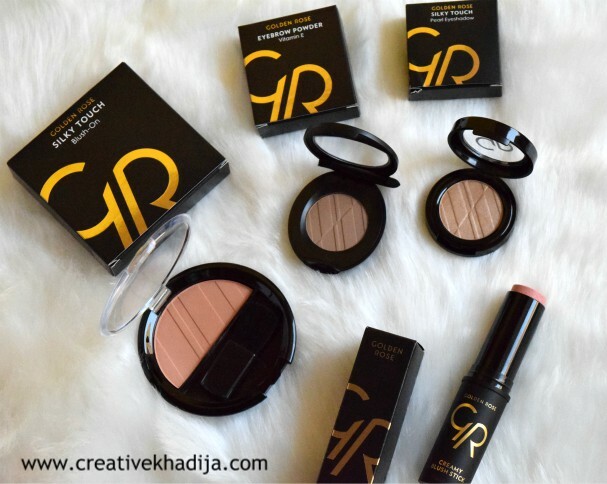 If you want to buy any of the above product, you can buy these online from Golden Rose Instagram and Golden Rose Facebook. If you have any question or suggestions, be sure to let me know. The product was provided by the brand for review purpose & all of the opinions are my own. 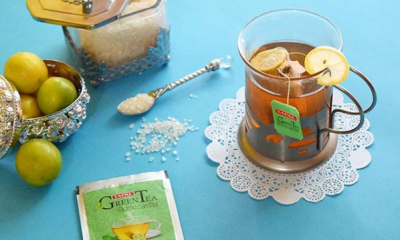 I hope my readers will be enjoying this new product review by me. 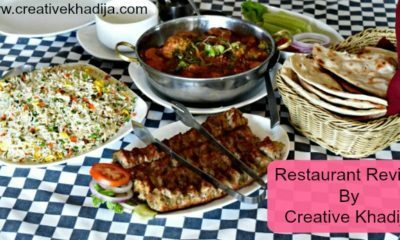 Thank you for checking & reading this detailed post. 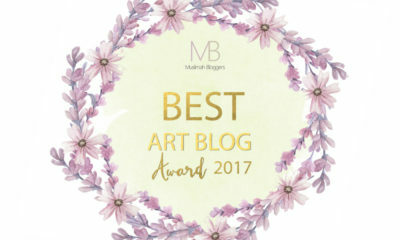 I hope you enjoyed this one of my longest review posts.